Welcome to Day #13 of Chocolate and Spice Theme Week. 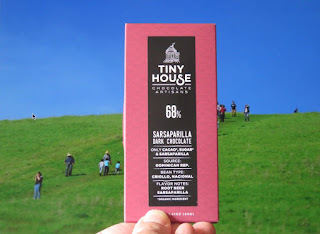 Today's 68% Sarsaparilla Dark Chocolate bar was from Tiny House Chocolate Artisans (Santa Cruz, CA). The makers, originally from Brazil, crafted this bar using three ingredients: organic cacao, sugar and sarsaparilla. The cacao was sourced from the Dominican Republic. And the cacao bean type was listed as: "Criollo, Nacional." The melt was smooth and creamy. There was a light smoky/botanical/woodsy earth taste to this chocolate. However, the most obvious aroma and taste was that of root beer or sarsaparilla. The chocolate and the inclusion paired well together. And this bar was not too sweet (thank you!). The flavor was unique deceptively complex; and it became more intriguing and interesting with subsequent bites during the morning. With its relatively dark, complex flavor and aroma profile I couldn't help but wonder what an adult beverage/beer version of this might taste like. In the meantime, it's a beautiful spring day and we're taking the rest of this bar to the park with us to enjoy later.